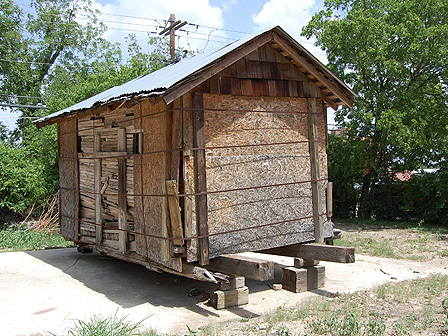 The moveable jail cell was constructed for the Hays County Jail in Kyle and, today, it is a rarity of its kind. The cells were referred to as “calaboose” and were constructed using the cribbing method where the walls are arranged in sets of logs or timber in a log-style cabin formation to create a rising rectangle or square. The jail cell remained in use until 1925 as Kyle’s city jail and, later, was moved to the Texana Village at Aquarena Springs. Due to lack of funding, the jail cell along with other buildings and artifacts were removed from the Village. At the eleventh hour, the jail cell was saved and moved to its current location in San Marcos. The jail cell is a valuable piece of Hays County history but for generations it has been shuffled around the county. It needs a permanent home where it can be restored and appreciated. Local advocates are working to raise funds and public support to preserve the moveable jail cell in order to tell a broader story of the county’s history.